A young boy at a picnic asks Ron Hall about the medals and badges that decorate his leather motorcycle vest. “It’s a way of telling people who you are,” Mr. Hall explains. 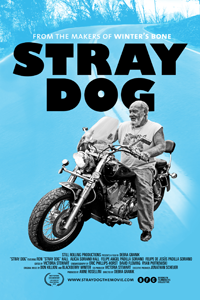 “Stray Dog,” Debra Granik’s new documentary, is all about who this man is. Mr. Hall, whose nickname gives the film its title, is a Vietnam veteran, a biker, the manager of a trailer park in southern Missouri, the patriarch of a multicultural family and much more. He’s a complicated American, and Ms. Granik honors that complexity. She met Mr. Hall when she was filming “Winter’s Bone,” her flinty tale, released in 2010, of a teenage girl (played by Jennifer Lawrence on the cusp of stardom) in a harsh Ozark landscape. In that movie, the region had the archaic, almost mythic atmosphere of a place governed by age-old codes and traditions. Mr. Hall, who had a small role in “Winter’s Bone,” inhabits a more familiarly modern world: a place of Interstate highways, chain restaurants, shopping malls and sterile office suites. But memories and historical symbols nonetheless hover in the air. Mr. Hall, a stocky man with a full white beard, has an eagle and Old Glory tattooed on his arm. The trailer where he lives and some of the T-shirts he wears have images of the Confederate and prisoner of war flags. He doesn’t talk much about politics, other than to voice weary disgust with the government, but it would be easy enough to infer an ideology from such emblems. It would also be a mistake. “Stray Dog” is valuable in many ways — as the sympathetic documentation of a family’s perseverance in hard times; as an example of compassionate cinéma vérité; as a chance to spend time with some very interesting people — but perhaps its greatest virtue lies in its powerful, implicit challenge to the lazy habit of looking at American life through polarized red- and blue-tinted lenses. Mr. Hall is proud of his military service, fiercely loyal to fellow soldiers who came home and devoted to the memory of those who didn’t. He also refused to forgive himself for some of his actions in Vietnam, as he explains, with tearful eloquence, to his therapist. Ms. Granik’s tact and curiosity are remarkable. So is her subject’s openness. We follow him, in a grand convoy of gray-haired motorcyclists, on a pilgrimage to the Vietnam Veterans Memorial in Washington. We eavesdrop on wrenching conversations he has with veterans of that war and later conflicts, and we overhear the advice he offers his friends and granddaughters. We are with him when he takes a friend to the dentist, and when he travels to Mexico to help his stepsons on their journey north to live with him. Those two young men — 19-year-old twins named Angel and Jesus — alter the perspective of the movie. We catch a glimpse of America, and also of Mr. Hall, through their shy, watchful, culture-shocked eyes as they try to reconcile the realities of rural Missouri with their expectations of the United States. Their stepfather scolds them when they try to put hot sauce on his corned beef and cabbage, and they struggle to understand what he says to them. Their mother, Alicia, speaks English a little better than her sons. Mr. Hall’s Spanish is fairly rudimentary, though he is determined to improve. But the couple has a sweet, patient rapport that transcends language. And “Stray Dog,” precisely by concentrating its attention on the everyday concerns of specific individuals, quietly illuminates something much larger. The movie is perfect viewing for Independence Day — a chance to get acquainted with the resilient, kind and independent spirit of a fellow citizen and the people he loves.